Stephanie Leavins is a uniquely distinctive and versatile singer, with many critically acclaimed albums in her repertoire to date. She has covered a dynamic range of vocal expression. Stephanie has dedicated her life to God, and ministers the Word through her beautiful gift of song. 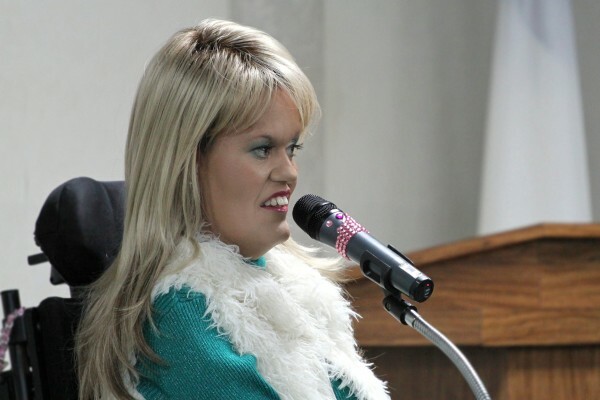 Stephanie was born with Muscular Dystrophy, and has spent her entire life in a wheelchair. Her faith in God was only strengthened because of this handicap. She has used this opportunity to inspire and encourage audiences all across the country. Her courage and the joy she has in her life is contagious. Your congregation will be blessed as she shares the many miracles God has performed in her life. Stephanie has devoted her life to telling people of God’s love and mercy through her testimony and song. Her ministry is one of hope and encouragement, and she would love to share her blessings with you.